Here is a meal that I made for myself when MaryJo flew up to Minnesota for a few days. I had just made a spiralized zucchini dish, and had leftover zucchini to use. I also had a lot of other items on hand to use. (You can end up with a lot of leftovers when you cook for two). 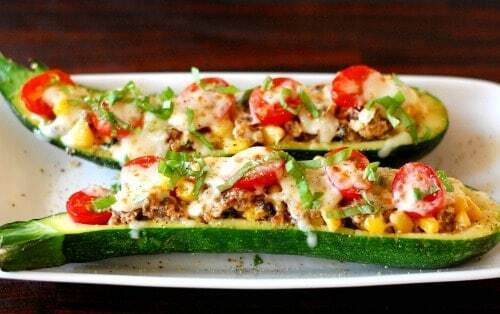 So I made Italian sausage stuffed zucchini boats. 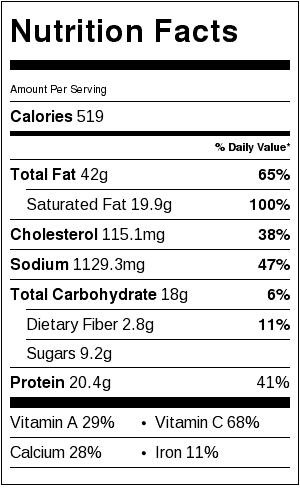 Let’s see…frozen Italian sausage in the freezer, an opened bag of frozen corn, old grape tomatoes, and some leftover grated cheese. I feel like I’ve got the makings of a Chopped episode, except that the ingredients aren’t weird. I blanched the whole zucchini in a large pot of boiling water for 5 minutes, then put it into room temperature water for a few minutes so it would cool. (I had room temperature water around because they turned the water off at our place for about 8 hours that day, and I had lots of pots of water sitting around). Then sliced the zucchini in half and scooped out the inner flesh. 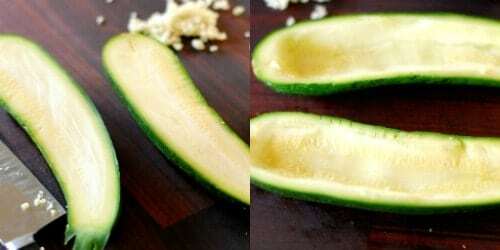 An alternative method would be to slice uncooked zucchini in half, then scoop out the middle, then blanch it for 2 minutes. I just figured it would be easier to scoop out softened zucchini. Then I ate the scooped out flesh. I wasn’t going to use it in the stuffing, so I just had a little before meal snack! I browned the sausage in a small skillet and then placed it in a small bowl. In the same skillet add the garlic and frozen corn. If it seems you need a little more oil, add a teaspoon or two of olive oil. I let that cook until heated through, then put the meat back in. I then added 2 ounces of cream cheese and melted that into the corn and meat. Taste the mixture and add a pinch of salt and some pepper if desired. 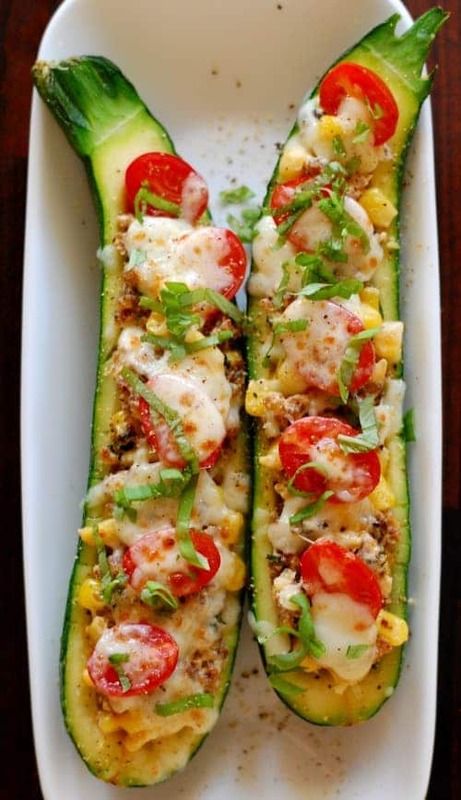 Fill the zucchini boats with the stuffing mixture using a spoon and your fingers to pile it on. 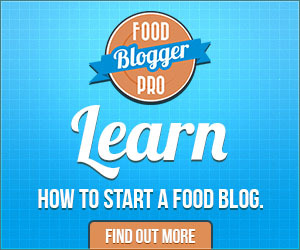 I added halved grape tomatoes, then covered with grated mozzarella and Parmesan cheese. Then it was under the broiler for about 3 minutes until the cheese melted and started to brown. I topped it with some shredded basil. This was a pretty easy meal to make and it was delicious to eat. I used up a lot of food that needed to be used, so the evening’s meal was a win-win. 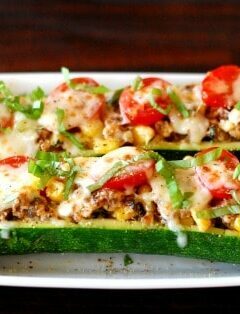 Italian sausage stuffed zucchini boats was dang good. You can nuke the zukes too. Faster. I love this idea! 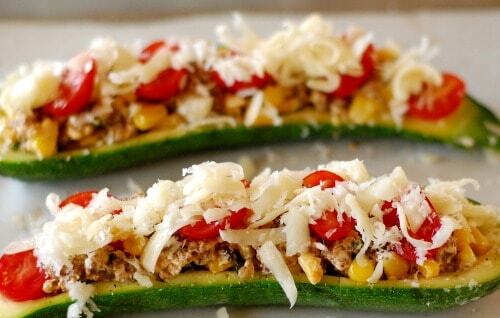 I bet it would be a hit as an appetizer at a party! It would be great. A little more cheese would help it to hold together when cut into bite sized pieces. It was really good and spicy with the “hot” Italian sausage.